Lace up those walking shoes, we’ve got a project for you. An intrepid cartographer has, with the help of Google Earth, tracked down the longest-possible straight land path on earth – and it starts in China. Just start walking due west from Shitangzhen, a town south of Taizhou, in Zhejiang Province. Keep on moseying, and in about 589 miles you’ll hit Wuhan. You will then, eventually, pass just south of Xi’an and (sooner or later) hit Qinghai. Getting tired yet? After a brisk hike (i.e. crossing the Himalayas) you’ll end up in Tajikistan. From there, it’s just a quick poke through Uzbekistan, Turkmenistan, Iran, Iraq, Jordan, Israel, Egypt (right through the heart of Cairo!) Libya, Niger, Burkina Faso, Ghana, Ivory Coast and, finally, hit Liberia. 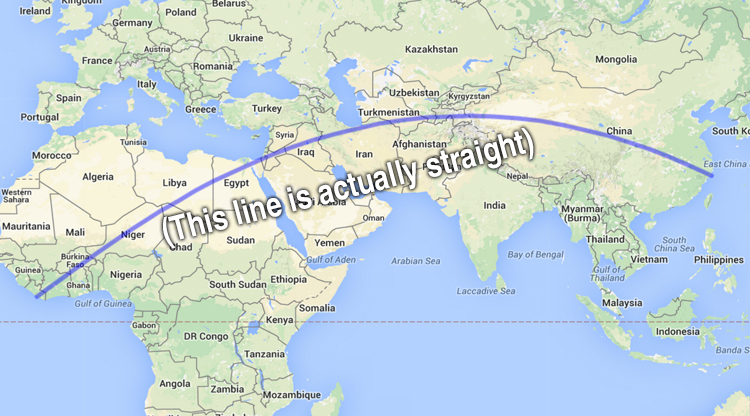 This longest-possible straight line across the globe comes, at several points, extremely close to not working out. In Israel, for example, the path very nearly runs into the Mediterranean, and in Iran, you’ll just miss the Caspian.